This past Sunday, Kiki and I joined 12 fantastic women in the March for Babies walk in downtown Indianapolis. Many of these moms came from Indianapolis, while several others made the trek from far and away places like Kentucky, Utah, and even Canada. Many of us "met" on the blogosphere and chat often on Twitter and Facebook. This bright and beautiful day, we all came together for one purpose: to honor the memory of the beautiful Maddie Spohr, and to raise awareness (and lots of cash) to help other families with babies born prematurely or with birth defects. When Boo saw that Kiki drew a picture for Braeden and his family, she wanted to draw one too. You know how it goes. . . everything Kiki does, Boo wants to do as well. And she said "you have to put it on your blog, so everyone can see it, just like you put Kiki's on there." The planet lost another great super hero on Saturday when Braeden, aka "Super Bub", passed away, just a few weeks shy of his fourth birthday. Braeden is the son of one of my dearest high school friends, Dawn, who I just recently reconnected with through Facebook. 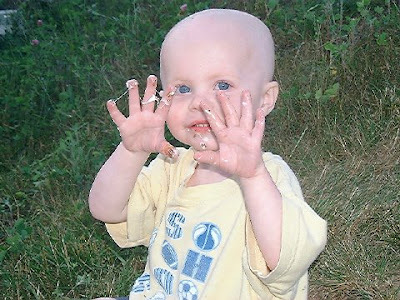 He battled Neuroblastoma, a type of cancer I'd heard of before, but did not really know much about. From what Dawn has told me, Neuroblastoma is the most common form of cancer found in infants, and occurs in children typically around age two. There is no known cure, and every 16 hours, a child with Neuroblastoma dies. I never met Braeden, but felt as if I knew him through all of the wonderful pictures and stories Dawn posted on Facebook and on his Carepages blog. I quickly learned that he loved blue "slushies", Cars characters, tools, fire trucks and trains, and that one of his favorite things to do was roast "mono monos" (marshmallows) with his family over the "wiya pit" (fire pit). Braeden's sticky fingers from the "mono monos"
I "introduced" my own girls to Braeden by showing them his pictures, telling them of his illness, and we prayed so hard for him everyday. My girls even drew him pictures and talked about him as if he lived next door. I know that they were touched by his life and felt a connection to him. When Dawn posted of his passing, I was afraid to tell my girls. We were in the middle of a fun weekend with family in town and I didn't want to make them sad. Kiki especially worried about him and frequently asked me how he was doing. She wanted to know if our prayers were working, if he was getting better. So I knew when I told her she'd be crushed. I was right. Kiki asked about him again last night and I told her that he had died, but that he no longer felt any pain. He was happy now and looking at her from up above. She smiled and looked up and said "I love you". It took all of the strength I had to hold back the tears. Kiki said that Braeden is an angel now and will be forever with his family, watching over them and "taking care of them." Braeden, we didn't know you personally, but we loved you so much. You touched our lives and we will forever be thankful for that. We know the world is a better place since you were a part of it. We are sad you are gone from us now, but we know you are no longer in pain and that gives us comfort. We will continue to fight for a cure. I know many people love to joke about the amount of time others spend on social media sites like Twitter, Facebook etc. But I really think these things can be used to do good for others. I've seen many examples of this since I've started using these sites, but last week, when a fellow mommy blogger's daughter passed away, I saw an outpouring of love and support I never thought possible for someone most of them had never met in person. Heather and Mike, of The Spohrs are Multiplying, lost their beautiful 17 month old Maddie last week, after she was admitted to the hospital for respiratory problems. For many of us who followed Maddie's story since before she was born, this was so heartbreaking. We watched this child come into this world, weeks before she was ready, struggle to fight her way out of the NICU, and eventually blossom into a bright and beautiful child. I may have never met Heather, or Maddie, but because I had been reading her stories on her blog, I felt as though I knew her personally. Needless to say I cried as if she was one of my own when I learned of her passing. I follow Heather on Twitter and reading what followed Maddie's death was so heartwarming. Thousands of people spread the message of her death, reached out to help Heather in so many ways it is unbelievable. 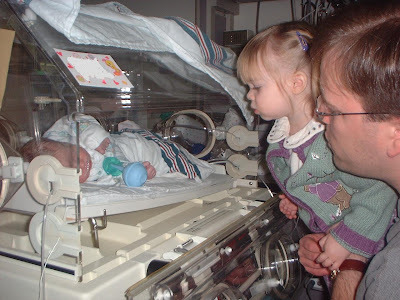 I think part of the reason I was so touched is that my own Boo spent ten days in the NICU after she was born. Unlike most of the other infants in the NICU with her, Boo was born eleven days late instead of weeks premature. 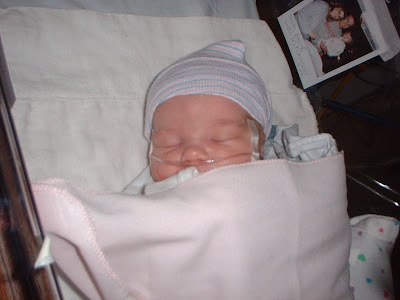 She was what the nurses often called "the giant" of the NICU at 9 lbs 2 oz. Yet she was not breathing and had no heartbeat when she was born and had seizures shortly after she was revived. She was a fighter though, and made it out of the NICU after ten days. While she was in the hospital, my husband and I practically lived in that NICU with her, and had a chance to see many of the premature babies fighting for their lives. I saw how much the nurses and doctors had to do to help them live another day. I saw the celebrations that went on when one of them was able to go home, and the sadness when one of them did not make it. So I've always had a special place in my heart for children like Maddie. Her funeral is today, 2:30 PST, and I can't help but wish I could be there in person to support her parents. 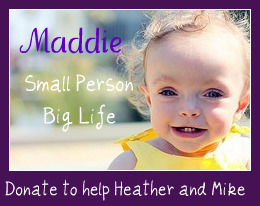 I know that it is not possible, so I will honor sweet Maddie by turning my blog purple today, and for the rest of the month. I also put her button on my sidebar so that anyone who wants to read her story and make a donation to the March of Dimes can do so. I also want to encourage everyone to put the internet to good use. Take the time to reach out to others and help those in need. There is so much negativity on the internet these days, in the news and in our world. I really think that we can use these "tools" to better our country and become more connected as people.